Prime Minister Netanyahu and his wife visited USS Ross docked at the Port of Ashdod. Israeli Prime Minister Benjamin Netanyahu and his wife visited the Arleigh Burke-class guided-missile destroyer USS ROSS (DDG 71) at the Port of Ashdod, on Thursday, accompanied by U.S. Ambassador to Israel David Friedman. During the visit, PM Netanyahu toured the ship, met the Sailors and officers who command the vessel, and gave remarks at a celebration marking the 243rd birthday of the U.S. Navy. "We gather here tonight on this beautiful ship, on this beautiful night", said Netanyahu, "to celebrate the 243rd birthday of the United States navy". 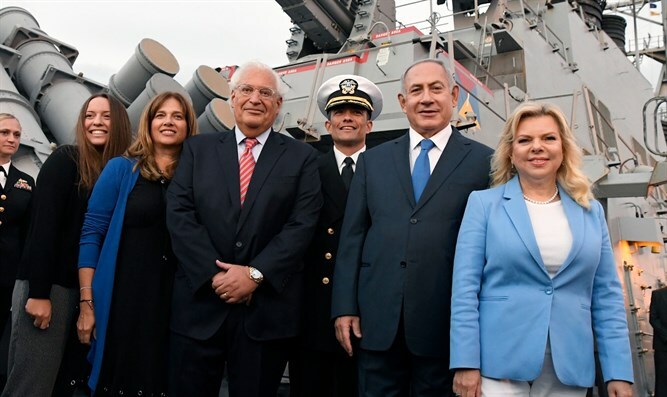 PM Netanyahu praised the US Navy: "From a modest beginning of just two gun boats in 1775, today the navy has some 286 sophisticated ships, more than 3,700 aircraft and more than 600,000 active duty, reserve and civilian personnel. But even more impressive than its awesome size and power, the navy operates every day throughout the world in calm seas and in rough waters protecting American citizens, American allies and American values." Netanyahu expressed his hope that the symbolism of the event will not be lost upon anyone. "Israel and the United States have enjoyed a close and mutually beneficial relationship for decades", emphasized Netanyahu, "The presence of the USS Ross in Ashdod and her patrols throughout the Mediterranean Sea represent the commitment of the United States to provide credible defensive assistance to Israel against all external threats". "This vessel is a testament to American resolve to confront and defeat violent extremist organizations and nations wherever they operate. There is no more fitting place for the USS Ross to seek safe harbor than the State of Israel which stands on the front lines of this effort as a critical partner with the United States."